Pancalen Cycles: Irfan "Ippe" Wahyudi's Cannondale "TRack"
Irfan "Ippe" Wahyudi's Cannondale "TRack"
Let’s put it this way: imagine that once in your lifetime, you spot a picture of a beautiful classic track machine and then you decided that one day the bike should be yours. Imagine that one day you’re finally able to obtain one, and you become one of the very rare few to have said bike in your country. You want to ride it every day so the bike was adapted for daily road use, and turns out itsuits you very well. This is what happened to Irfan “Ippe” Wahyudi, the mastermind behind Cyclonesia. The Track is one of the ‘90s track cycling culture icon. Along with Cannondale’s signature smooth welds and fat tubes, the Track also features some unusual approach in design. Take the rear dropouts that looks like they’re left behind the seatstay/chainstay junction. Since the chainstays are short to provide extra stiffness, to make room for rear tire, rather than giving the seattube a bit of curvature or any other approach it was simply welded offset to the bottom bracket shell. To make way for heel, chainring and tire clearance the straight-tubed chainstays was simply dented in certain places. The short raked steel track fork give this bike a tight clearance—and razor-sharp handling. Brought to Jakarta from The Land Down Under, Ippe used his Track mainly for daily commute. 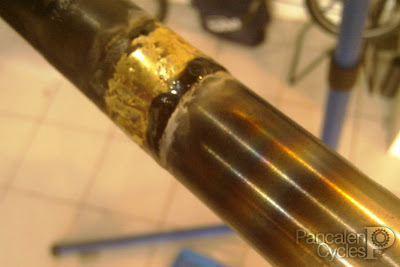 One day he came across a good deal on eBay: a Wound Up carbon road fork on the cheap. When the fork finally arrived it was clear why it was sold on a basement bargain price: the steerer is too short, as if it was installed on a small-sized frame. 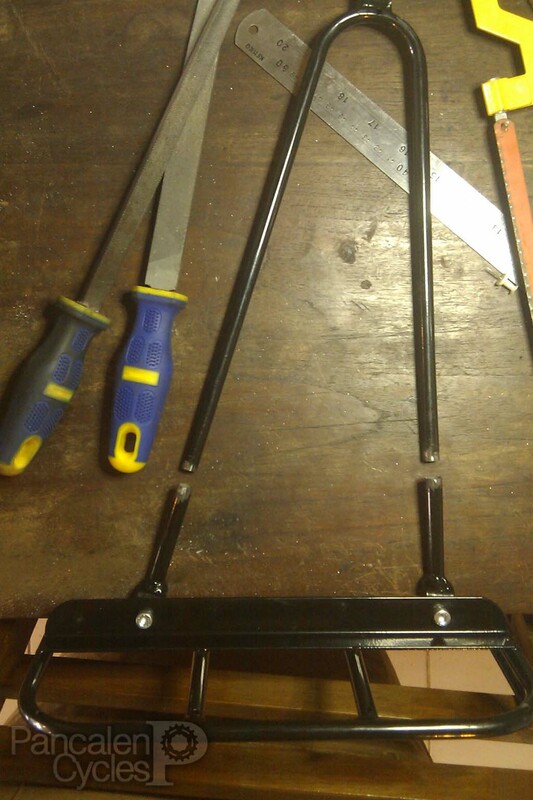 Knowing that it wouldn’t fit, the fork was listed on our shop for resale. Later on, Ippe decided to put a front rack on his Track. 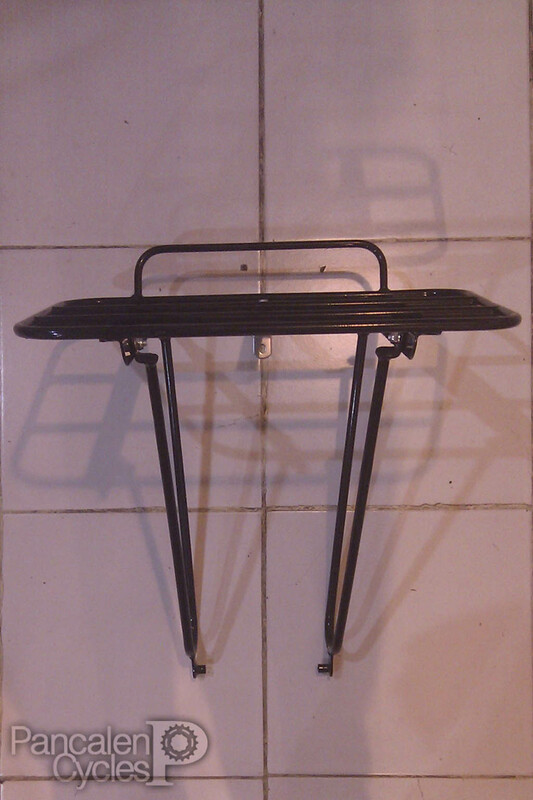 At first he want to go with TCB Courier-made rack, but they’re no longer available. 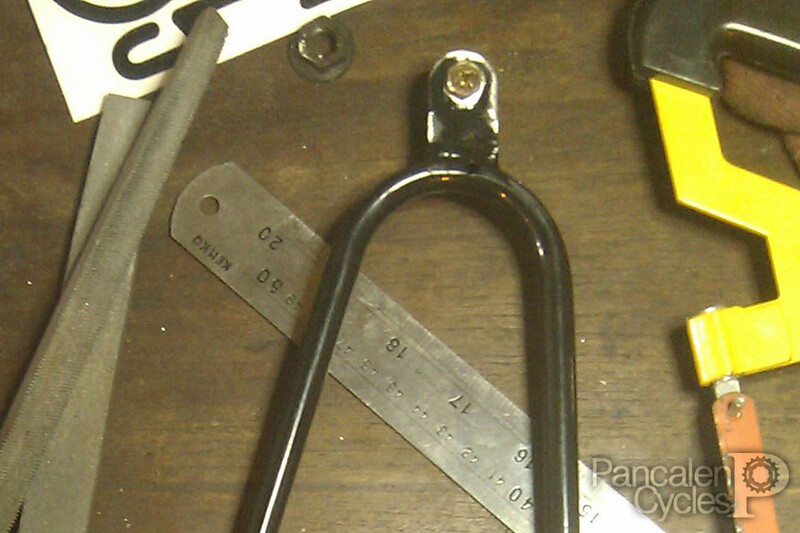 Alternatively he went with Gamoh/Minoura Porteur rack which required a mounting hole on the fork crown, a feature not found on track forks but common on a road fork. So out come the Wound Up, but the steerer needs to be extended a bit... and that’s exactly what we did while waiting for the Porteur to arrive from Japan. 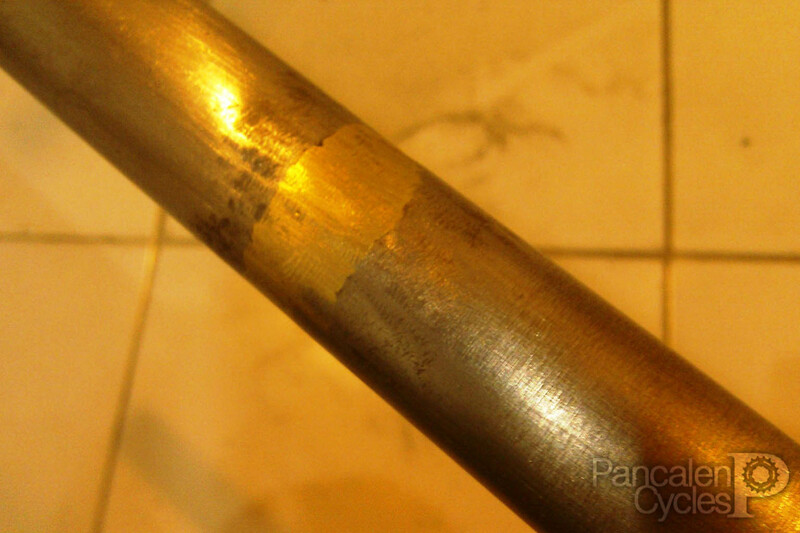 Inside this brazing mess is a steel inner sleeve to ensure the joint is strong enough. After a couple of hours hand filing the joint, here's the result. The inner sleeve prevents the usage of classic quill stem, so we convert it to threadless headset system. The fork finished just in time when the rack arrived, but some packing mistake happened caused the rack came with both left legs. Shipping it back to Japan will be time consuming, so we perform another surgery to make one of those legs, um, right. Prior the surgery. 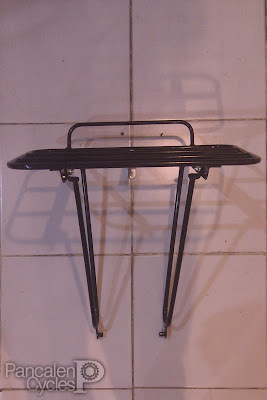 Note that the upper rack mounts are facing the same direction. 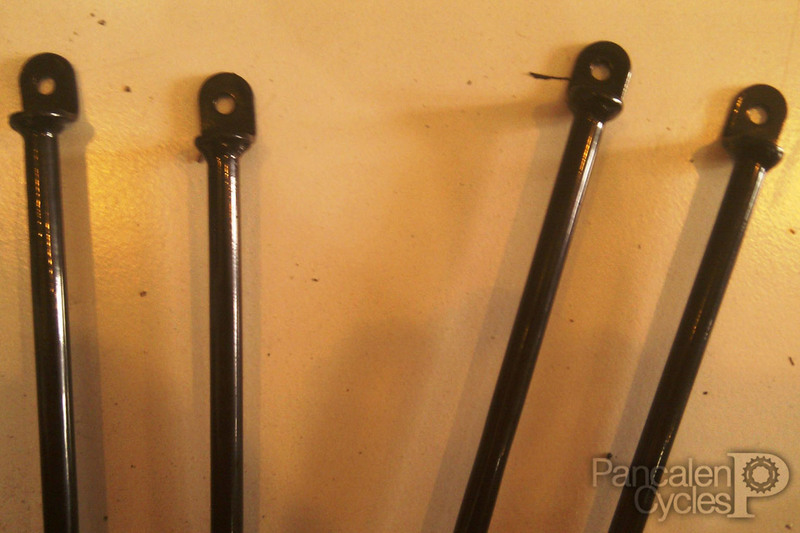 We cut the legs, turn them to correct position, then reweld them. We modify the lower mount as well. The end result is surely a head turner. Next time you spot a blue Track with a front rack swerving the streets of Jakarta, make sure to wave and say hi!